In my opinion, that’s not necessarily true. Some of the best stories published about Apple come straight from the rank and file. Take Andy Hertzfeld’s Revolution in the Valley, taken from his online Folklore project. It digs into the Macintosh project, as told by the engineers that built that revolutionary computer. In my opinion, the “definitive” book about Jobs would be one that concentrated on his professional life, and blended the Steve-centric view with those of the many people who worked with him at Apple and elsewhere. It’s the book’s most surprising quote, completely at odds with Jobs’ public image. But Jobs was indecisive, sometimes cripplingly so. He was so unsure about the furniture in his house, it remained famously unfurnished. He even dithered about how to treat the cancer that tragically took his life. In fact, Jobs’ indecisiveness is rich territory to explore. But it’s counter to his image and reputation, so it is left alone in this biography. I wouldn’t argue that Jobs is a much more complex character than he’s been portrayed in previous books, but his obvious talents and contributions aren’t spelled out in Becoming Steve Jobs. Despite the publisher’s claims, this isn’t the book that throws light on how Jobs operated. It just says it is. While it’s not really fair to criticize authors for the book they didn’t write, Becoming Steve Jobs suffers from the same problem as Isaacson’s biography and many other accounts — it focuses on Jobs’ personal life, not his professional one. Leander has written books about Steve Jobs and Jonny Ive which were widely praised so he is considered a good judge for review in this case. I’m currently reading Becoming Steve Jobs at the moment so will consider my own view soon. On iOS, you can enable Instant Sync in Settings to allow Instapaper to send you silent push notifications when you save a new article. The silent push notification allows the iOS app to download the new content from the server immediately, and the result is better syncing between your iOS devices and our servers. Please note that Instant Sync is subject to Apple’s battery-saving algorithms, and as such is not 100% reliable. We’ve found that Instant Sync is completely reliable when the device is plugged in and on WiFi, fairly reliable when just on WiFi, and basically a coin toss over a cellular connection. But when it works, it’s amazing! This a fantastic update to Instapaper that I have been waiting for. For a while I have been using Pocket to collect the articles and sites I wish to read later or link to because of Pocket’s instant sync feature – which showed via the notification badge above the app icon, of your total saved articles. Instapaper always used the somewhat delayed background updating which wasn’t instant – now it is. The Tweet Shot feature is another great addition to the app for selecting, quoting and sharing pieces of text really quickly. Instapaper has just become my new favourite read later service of choice. A new application called Fradio is officially launching today, offering a service that allows anyone to become a DJ, broadcasting their favorite tracks to their friends or fans, and even talking over the tunes with a push of a button in order to engage their audience. The app, which is backed by Australian music service Guvera, is making its debut at the SXSW music festival in Austin where a number of artists, including Steve Aoki, A-Trak, and Crookerwill, be among its first testers. For those just starting their journey into the world of coding, however, those resources are still intimidating to jump into. Enter Swifty, an app that provides an interactive set of tutorials that gradually guide you through the basics of Swift on your iPhone or iPad. There are more than 200 tutorials in Swifty, starting with the very basics of variables and data types and progressing to the essentials of object-oriented programming. Obviously the iPhone keyboard isn’t the best tool for cranking out lines of code (especially if you’re just starting out), so creator Johannes Berger came up with an interesting interface that looks and feels like coding while actually acting more like an interactive quiz. Each tutorial in Swifty starts with a one-to-three-sentence explanation of a new concept or an important aspect of a concept previously covered. Below, you’re shown a few lines of pre-written code, with a blank field where some vital name, type or value is missing. When you tap it, it lets you choose from several options. If you choose one of the correct options (sometimes it gives you several that work to demonstrate different output), it “runs” the code and shows the result. Now, the output from the “console” at the bottom of the screen is pre-written — you’re not actually writing working code in the app. But the format quickly gets you comfortable with the look of Swift code and things like naming and accepted styles for creating blocks of code in functions or classes. While it might be a bit difficult for me to judge given my prior experience with the language and coding in general, I think most novices could jump into Xcode’s “Playgrounds” and muck around with simple text-based projects after an hour or two of using Swifty. It’s clear that a lot of work went into making Swifty as accessible as possible, and that the app is worth the $2.99 to unlock every lesson if you spend some time on public transit that you’d like to use to become more familiar with Swift. If you’re not sure about the app (or even learning the language itself), you can make your way through the app’s first 13 tutorials for free. A great insight and start into those who are looking at getting into Swift programming. Today, I feel comfortable saying that Fantastical 2 is the best calendar app for Mac I’ve ever used. It’s really simple as that, and I wouldn’t be honest if I didn’t recognize the effort that went into this new version of the app. No other calendar client – not Apple’s Calendar, not Sunrise, and certainly not the original Fantastical – gets close to the masterful blend of simplicity and power of Fantastical 2. Fantastic detailed review as always from Federico – It sounds like the perfect calendar replacement app on OS X. If you are serious about your schedule, then you can download it from the Mac App Store for £29.99/$39.99 for a discounted limited time here. Some people will always want to own and wear traditional watches, but they’ll only become more of a niche, not a growing market. People will buy whichever kind of smartwatch works with their phone platform — iPhone owners will get Apple Watches, and Android owners will get Pebbles or Android Wear watches — and then, most of them will be effectively removed from the traditional watch world from that point forward. According to the report, Nintendo wants to create a gaming membership service that would span smartphone, and traditional games consoles. It’s unclear how this would work on Apple’s platforms in conjunction with the App Store rules on In-App Purchases. The games would be ‘new experiences’, not simply ports of existing Wii U and DS titles. Doesn’t sound particular straight forward, but still a good sign that Nintendo are seeing sense. We look forward to hearing more on their future plans. Iawata said that smartphones and dedicated games devices were different platforms, and he believed people wanted different things from them. My understanding is that, on smart devices, the main demand is for very accessible games which smart device users can easily start and easily finish. These are not necessarily the characteristics that people demand from games for dedicated video game systems. Actually, this is one of the reasons why we believe that we should not port games for dedicated game systems to smart devices just as they are. We imagined the same lunch two months from now, when we both have Apple Watches. If a notification came in, I wouldn’t get a buzz that he could hear and he wouldn’t get a buzz that I could hear. We’d each get a discreet tap alerting us — and us alone — to the notification. A turn of the wrist and a causal glimpse, and we could see what the notification was for, and either who it was from or what it was about. With that information, we could choose to ignore the notification or, if it was urgent, we could excuse ourselves to handle it. The difference can be seen in something as simple as checking the time. Neither of us had watches because the iPhone has become our watch. Yet when either of us wanted to check and see if we needed to start wrapping up, we again had to make the visually loud and obnoxious gesture of reaching into our pockets. Less staring down at phones and more interacting with the world. Can only be good. The actual Launcher app is as convenient as it used to be when it was first released in September. Launcher lets you create shortcuts to other apps (both Apple and third-party ones) that will be displayed as a grid in the Today view of Notification Center. Upon first launch, the app will offer a selection of built-in shortcuts based on your contacts, but the best part is the ability to create your own buttons for installed apps and any URL scheme you know. In my case, I created shortcuts to Shazam, Google search and Maps, 1Password, and even a couple of MacStories webpages. Fantastic detailed piece from Federico Viticci over at MacStories highlighting just how useful this app can be. You can have shortcuts to specific tasks within apps available very quickly, just by pulling down the Notification Center or you could have some apps that you have hidden away in folders or anywhere for that matter, now available as a shortcut in the Notification Center. Very useful app. 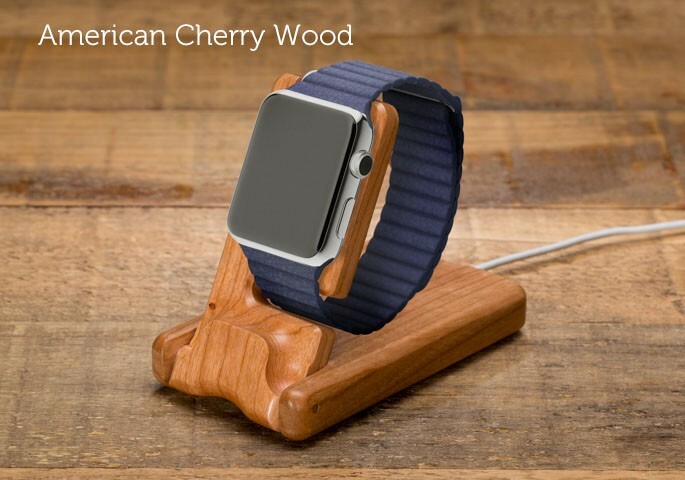 Hand finished and cut from hardwood, these stands offer a solid and natural finish to put your new Apple Watch in each night – if you have a wood-effect bedside table, then this is obviously ideal. 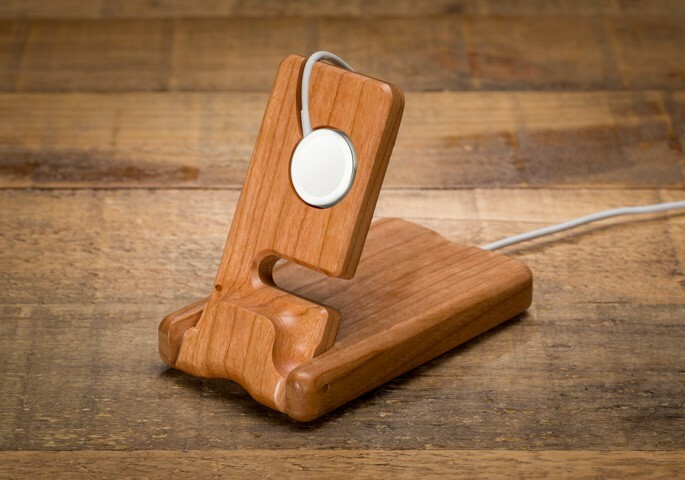 Also available in a darker mahogany style, you can pick one up here and they are priced at $69.99/$79.99. 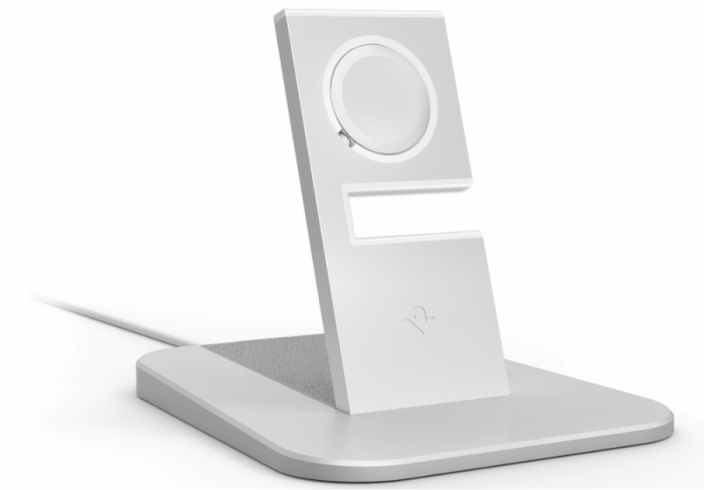 Based on their designs for their iPhone and iPad charging docks, Twelve South’s solution is to offer a choice of 2 colours white and black, with a more aluminium-look and feel to their stands. Not yet available to pre-order, they will be priced at $49.99 and you can sign up to be notified when they will be available for pre-order. 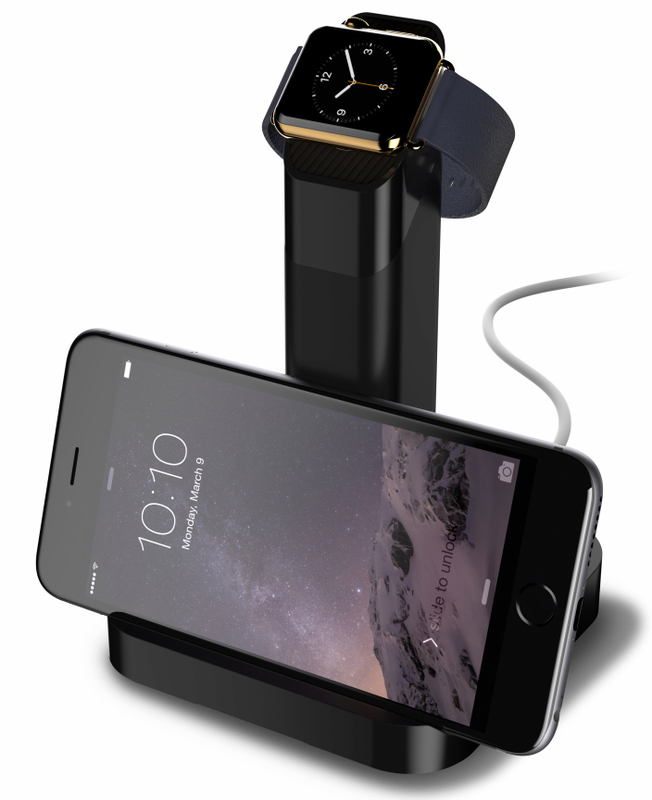 Griffin Technology are also letting people sign up for their upcoming Apple Watch cradle with the announcement of the WatchStand. You can sign up to be notified for more information regarding it’s release here. 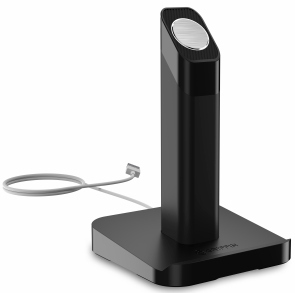 I personally prefer the silver HiRise solution as I like my devices to match with the white/silver combination of colours so I have signed up to be notified and then order when they become available. These solutions certainly won’t be the last to be announced for the Apple Watch but it’s good that folks are planning ahead.